Hungary is Red Bull and Ferrari country. So Lewis Hamilton's win in the Hungarian Grand Prix in his Mercedes was unexpected. Here's how he won his fifth race of the 2018 season. It is difficult to overtake here, was a constant refrain from the drivers. So qualifying was crucial. Along came the rain in qualifying on Saturday to mix up the grid. And so Hamilton won an unexpected pole while his teammate Valtteri Bottas joined him on the front row. Ferrari drivers Sebastian Vettel and Kimi Raikkonen filled row two. The Red Bulls were off their expected pace, so Max Verstappen only started seventh while his teammate Daniel Ricciardo, on the wrong tires at the wrong time, was way back in 12th. Because they had been on rain tires in qualifying, the drivers could choose any of Pirelli's slick tire compounds - soft, medium and ultra soft - to start the race. 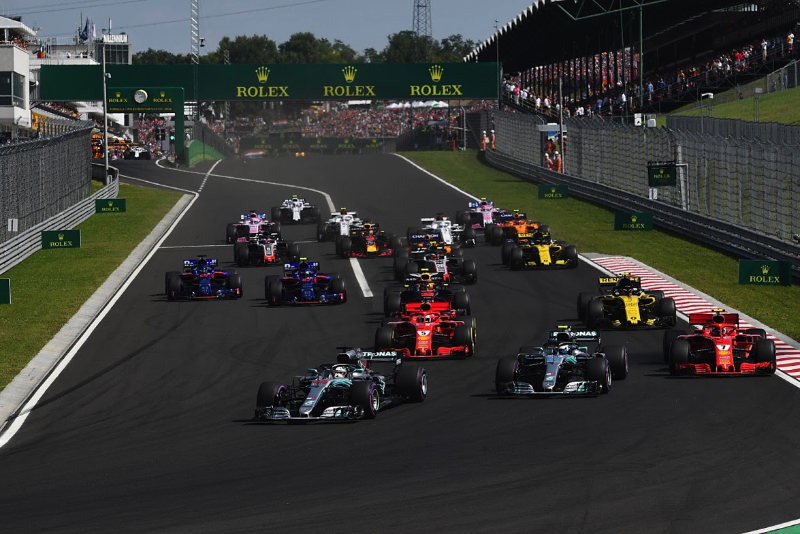 Hamilton, Bottas, Raikkonen and Verstappen went with the faster but less durable ultra softs, while Vettel, Sainz and Ricciardo chose the softs. Hamilton jumped into the lead and had a gap of one second over Bottas by the end of lap one. Vettel moved from fourth to third, Raikkonen dropped to fourth, and Verstappen went up to fifth. "No power! No power!" Verstappen radioed as he coasted to a stop on lap 10. Raikkonen's drinks bottle was malfunctioning, certainly not a welcome thing on such a hot afternoon. "Lewis drove a faultless race: he made a perfect start, then started building the gap on the ultra soft tire," said Mercedes team boss Toto Wolff. "He took that first set longer than we had planned before pitting, then managed the soft tire extremely well to the finish. It's a simple race to summarize but that doesn't take anything away from the skill it took to deliver such a polished performance." Ricciardo started 12th, fell to 16th and went to fourth, passing all drivers ahead of him except his teammate Verstappen who was running fifth when his engine quit. While Hamilton had a comfortable lead, the race came alive with about 10 laps to go as Bottas, Vettel and Raikkonen diced for second place. "I think we could go with Lewis today in terms of race pace," Vettel said. "I had a good start on the harder tire, which was good, and I was in third. Then I think we did well. Then it was a bit tricky knowing when to come in. We had a little bit of an issue at the pit stop and we came out behind Valtteri." "I realized right away I couldn't get Valtteri because his tyres were still too fresh," Vettel said. "So I was sitting back and waiting and trying to line everything up for the last 10 laps and it worked. His tires were getting worse and worse, and I knew obviously how long those yellow (soft compound) tires would last from the first stint that I had. So I was quite confident I could get him at the end." Vettel put in a pass on Bottas on lap 66, but the Ferrari's left rear tire clipped the right front wing of the Mercedes. "I had an incident with Sebastian going into Turn 2," Bottas said. "He was on the outside, I still had my nose inside. He turned in early, there was nowhere to go for me, so we touched and I had damage to my front wing." Bottas and his wounded Mercedes dropped back into the clutches of the charging Ricciardo. Ricciardo and Bottas tangled at the start of lap 68. This time Bottas' left front wing got clipped. "For me it was a racing incident with Sebastian, and so was the incident with Daniel," Bottas said. "Again, I was on the inside, he was on the outside. Half of my front wing was missing at that time, I was locking up, and we touched." Now in clean air, Vettel drove the final laps to finish second just ahead of Raikkonen. "Obviously P2 is not what we really wanted this weekend," Vettel said, "but I think it's the maximum we could get today." Raikkonen and Ferrari tried a two pit stop strategy to jump ahead. "We caught up with Bottas after the first stop but there was not chance to overtake at that point," he said, "so our option was to stop again and try again and at least we got one place back. Far from ideal. I think we had pretty good speed today but what can you do? Sometimes it's like that, but we take the points and go for the next one." So Hamilton goes into the F1 summer break with another unexpected win over Ferrari. "We came to Hungary with damage limitation as our motto," said Wolff. "So it's pretty good to be leaving after out-scoring our rivals, even if by just a few small points. In the other car, Valtteri drove what I think was his best race in his time so far at Mercedes."